After five intense rounds in which heavy hits were consistently exchanged, Juan Manuel Marquez brought a thunderous right hand upon Manny Pacquiao’s face at 2:59 of the sixth round. 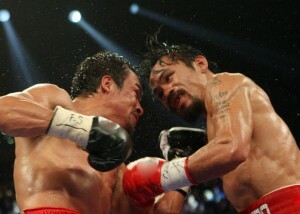 Pacquiao fell face first onto the canvas, out cold for a whole two minutes, and the Marquez and Pacquiao fight was over. Marquez knocks Pacquiao out cold during sixth round of fight. Referee Kenny Bayless didn’t even bother to count. Marquez leaped into his handler’s arms while the MGM crowd exploded into applause. Pacquiao’s wife cried by the ringside. This was the fourth Marquez and Pacquiao fight between the two men within the last eight years, and many speculate that this may be the end of Pacquiao’s career, though he later said he would like Marquez again for a fifth time. Marquez went down in the fifth round and Pacquiao went down in the third round, but both men continued getting up to exchange hits. Then Marquez threw a punch that connected in all the right ways, and the Marquez and Pacquiao fight was over. After waking up and being helped to his corner, Pacquiao blankly stared at everything and nothing while his handler cut off his gloves. Pacquiao went to the hospital for some basic examinations. Previously, Marquez lost two close fights to Pacquiao and a third ended with a draw. He had vowed to eventually win a fight against Pacquiao, and that day has finally arrived. We expect Marquez to celebrate for a while before stepping back into the ring.